That is actually remarkable, if true. If someone overdoses then the police get involved. Why deal to a liability? True, but accidental overdose is a risk with any long-term drug user; people build up a resistance. 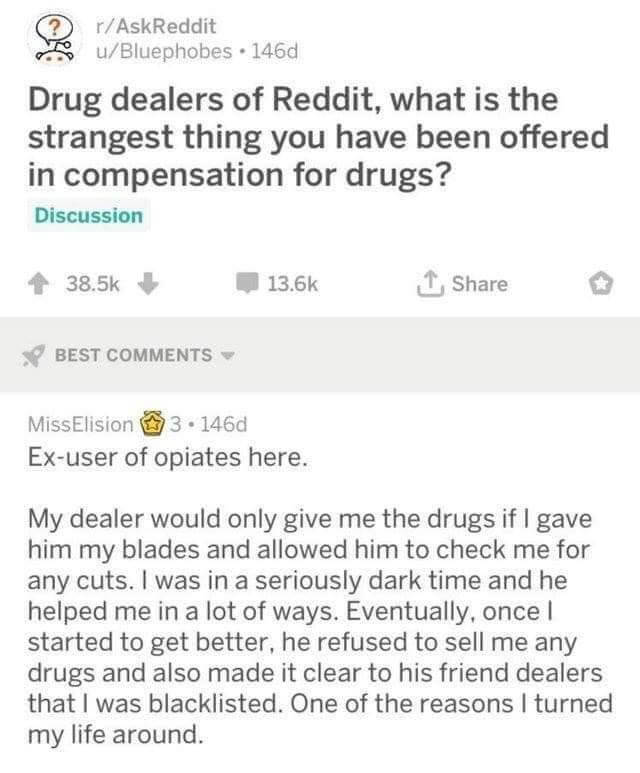 I’m just guessing, but it doesn’t make logical sense that a drug dealer would purposely wean all of their clients off of their products, so I think that denying this person was a special choice due to having compassion, rather than an impartial choice. If you were thinking intentional overdose, that’s not overly likely either. In the majority of cases, cutting is entirely unrelated to suicidal ideation. Cutting is just a short term distraction tool; create a sharp pain and something that must be dealt with immediately, and then you don’t have to think about the big problem(s) for a while. It can be more or less cured in most cases just with a bit of therapy; just teach people to talk about their feelings instead of bottling them up. I was thinking intentional overdose, so I can keep selling to those guys then? I mean, it’s still a crime either way. I’m just saying comparative risk factors are not that different. Which bit is ‘remarkable’? Good dealer or she “turned her life around”? Well, I meant the first, but the second is good too. Statistically speaking, the second fixes itself more often than not if the underlying cause is fixed. IE all those studies that show if you give the homeless a house, and assistance finding a job, the vast majority will get clean on their own with no other intervention needed. Opioid painkillers especially; most people who end up addicted to them are actually in severe pain, and the addiction is a side-effect of desperately wanting to be pain-free. I wonder if they were undercover… sounds sus.